>> 2018 MTA Peer Group Investment Opportunities! Stay up-to-date on daily happenings at the MTA offices by following us on Facebook. From peer group meetings to annual conferences and everything in between, get the scoop on what’s happening at our offices! The Wireline Competition Bureau issued a public notice on May 7, 2018, announcing 217 revised offers of A-CAM support, consistent with the March 23, 2018 Rate-of-Return Reform Order. In the Order, the FCC directed the Bureau to offer additional support up to $146.10 per location to all carriers that accepted the first revised offers of A-CAM support. Under this second revised offer, all locations with costs above $52.50 will be funded up to a per-location funding cap of $146.10, with deployment obligations adjusted accordingly. The accompanying report shows the revised state-level offers of model-based support and revised deployment obligations for each carrier that has already been authorized to receive A-CAM and is eligible to elect a second revised offer. These carriers have until June 21, 2018, to notify the Bureau, on a state-by state basis, whether they elect to receive the revised amount of model-based support. If a carrier fails to submit any final election letter by the June 21, 2018 deadline, it will be deemed to have declined the second revised offer. On April 12, U.S. Senator Tina Smith introduced legislation—the Community Connect Grant Program Act—to establish the U.S. Department of Agriculture (USDA) program under law and make improvements to the grant program that makes funding available for broadband projects in tribal, low-income, and remote rural areas. The USDA Community Connect program through the Rural Utilities Service (RUS) helps fund broadband deployment into rural communities. In addition to authorizing the program and targeting areas that lack access across the nation, Sen. Smith’s bill would increase internet speed service under the program because she hears time and time again that this is a real concern for Minnesotans. Provide grants to construct, acquire, or lease facilities—including spectrum, land, or buildings—to deploy broadband service. Modernize minimum speed service to coordinate with the Federal Communications Commission and keep pace with 21st Century needs. Provide essential community facilities—like fire stations and public schools—with service for up to two years. A portion of the grant funding may also be used to improve, expand, construct, or acquire a community center within the proposed service area to provide community access. Avoid duplicating deployment efforts by not building over existing broadband networks, responsibly investing federal funding and taxpayer money. 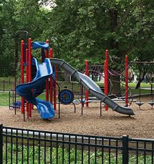 Authorize funding for Community Connect grants at $50 million per fiscal year. You can learn more about the Community Grant Program Act here. 2018 MTA Peer Group Investment Opportunities Are Available! Get tons of visibility and have engaging conversations with members, build relationships with small but highly-focused groups, and support our core cause. MTA’s core purpose is to enhance the success and viability of its telecommunications industry members. You are an important part of helping us fulfill this mission. Here is your opportunity to maximize the impact of your event sponsorships for 2018! >> Download the 2018 Peer Group Investment Opportunities as a PDF. It’s already the middle of May, which means school will soon be out for summer vacation. With that will come more frequent trips to local playgrounds for fresh air and exercise. Forty years ago, playgrounds were downright scary. Everything was made of metal. The slides were so hot they'd burn the skin right off your thighs. Kids would go flying off of those spinning machines, or perch precariously 10 feet in the air on monkey bars with rock-hard earth or concrete underneath. Luckily they don’t make things like they used to! Improper protective surfaces: Fall surfaces should be made of wood chips, mulch, wood fibers, sand, pea gravel, shredded tires or rubber mats and should be at least 12 inches deep. Also, the area under and around play equipment where a child might fall should be a minimum of 6 feet in all directions. Protrusion hazards: Beware of hardware that is capable of piercing or cutting a child (bolts, hooks, rungs, etc. ), or catching strings or items of clothing. Children should never wear drawstring hoodies at the playground. Head entrapment hazards: There should be no openings that measure between 3-½ and 9 inches. Trip hazards, like rocks or tree stumps. Equipment not recommended for public playgrounds: One example is monkey bars. The number of injuries caused by monkey bars is so significant that many experts recommend they be removed from all playgrounds. PERHAM, MINN., MAY 1, 2018—Arvig Enterprises, Inc. (dba Arvig), announced the purchase of Palmer Wireless, a local wireless company serving the St. Cloud metro area. The all-asset purchase includes 24 miles of fiber around the St. Cloud to Big Lake area. Arvig will assume the service contracts for approximately 1,500 residential fixed-wireless internet customers along with a handful of voice customers. The company will continue to expand its network by utilizing the existing Border-to-Border Broadband Development Grants awarded to Palmer Wireless in 2017—including a last-mile project near Duelm in southern Benton County; and last-mile fiber-to-the-premise project in Sherburne County near the St. Cloud airport. Palmer Wireless previously provided cell phone service to its customers, who were notified that the service would be discontinued effective March 30, 2018. Some members of the current staff have chosen to remain in place, including former owners Albert and Laura Kangas. Is there someone in your organization who you would like to add to the distribution list? Send their name, company and email address to info@mnta.org and we'll add them to the list. News Bytes is intended for MTA members. Redistribution is limited to internal audiences only. If you wish to be removed from the MTA email list, you may unsubscribe here: @@unsubscribe_url@@.